Item # 299857 Stash Points: 2,499 (?) This is the number of points you get in The Zumiez Stash for purchasing this item. Stash points are redeemable for exclusive rewards only available to Zumiez Stash members. To redeem your points check out the rewards catalog on thestash.zumiez.com. 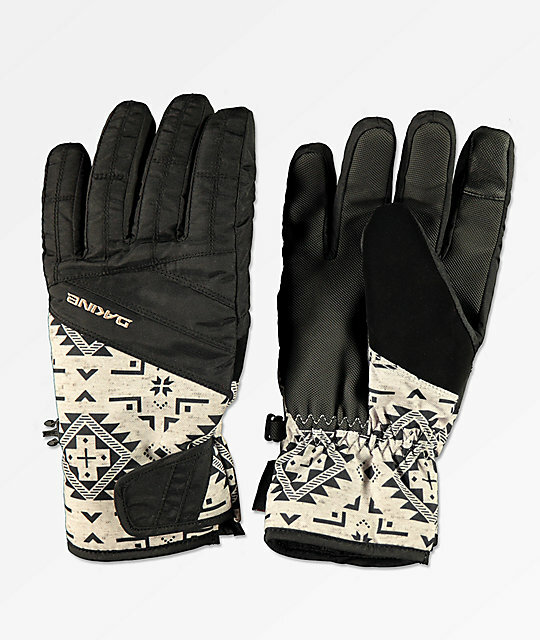 Get all the bells and whistles for your hands this winter with the Dakine Sienna Black Snowboard Gloves. These black and grey tribal print gloves feature 60g rated insulation for great mid-weight warmth without sacrificing dexterity, while the touch screen compatible construction will help skip those unwanted songs to keep the vibe going. Built in goggle wipes at the thumbs help further these gloves convenience so you can maintain visibility even on rainy days. Sienna Black Snowboard Gloves from Dakine. High Loft Synthetic Insulation 60g: A low-profile and lightweight insulation that resists moisture in wet conditions while trapping in heat.